A college star in both football and basketball, Peppers accounted for 9.5 sacks and 63 tackles as a junior in 2001 and was a consensus All-American who also received the Rotary Lombardi Award as the nation’s best lineman and Chuck Bednarik Award as the leading overall defensive player. He chose to enter the NFL draft and was taken by the Panthers in the first round (second overall). He immediately moved into the starting lineup at left end and showed off outstanding speed and pass-rushing skill, although he was weaker against the run and was lost for the final four games due to a league suspension for using prohibited dietary supplements. Panthers went 7-9 to finish fourth in the NFC South. 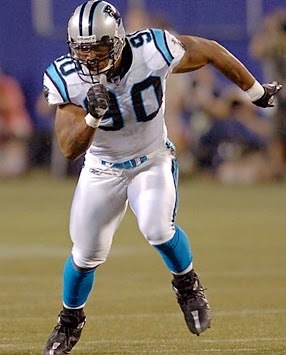 Heavily double-teamed in 2003, Peppers’ sack total dropped to 7 but the line as a whole, which included DE Mike Rucker and DTs Brentson Buckner and Kris Jenkins, excelled as the Panthers won the NFC Championship. Peppers improved in ’04, even as the line play overall dropped off, and received consensus first-team All-NFL and Pro Bowl recognition for the first time. Excellent at pursuit and improving against the run, he was named to the Pro Bowl again in 2005 and ’06 and again received consensus first-team All-NFL honors after the latter year. After reaching double figures in sacks for three straight seasons, Peppers dropped to 2.5 in an off-year in 2007, but came back with 14.5 sacks in 2008, the first of five consecutive Pro Bowl seasons. He signed with the Chicago Bears as a free agent in 2010 and, while his sack total dropped to 8, his presence on the line was beneficial overall and he was again a first-team All-NFL selection as well as Pro Bowler. After four years, he was released by the Bears following the 2013 season and signed by Green Bay for 2014. An outstanding overall talent, Peppers has been criticized for lack of consistent effort at times, but through 12 years he has been a consensus first-team All-NFL choice on three occasions, received at least second-team honors after two other years, and achieved selection to the Pro Bowl eight times. He has accumulated 119 sacks and 9 interceptions through 2013, two of which he returned for touchdowns, and has also had two scores on fumble recoveries.